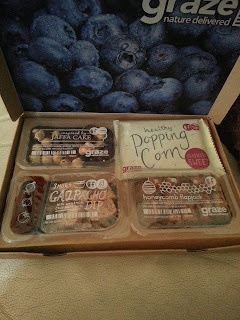 On monday I ordered a Graze box I've been hearing of them for a while now and finally decided to give it a try. Well it arrived today and it is yummy. You don't actually pick what is going to arrive in your box but they have a list of everything on they have on their website and you choose if you don't want it if you really want it etc etc. In my box I recieved honeycomb flapjack, slightly sweet popcorn, smoky gazpacho dip and jaffa cake which was nuts dried orange raisins and dark chocolate. this is what it comes in. I like how when you get the box (through the letterbox with your normal post) it has a little book and it tells you the story of how Graze boxes started. So if you would like to get your hands on one of these for free then go onto their website graze.com and you can enter this code to get your free nibble box YF4PDRZD you do need to enter your bank details but they take no money out and once you have your first box if you don't want anymore (the normal price being just under £4 a box) then you can cancel your account and that will be that. I hope you try one and enjoy it as much as I did.